“Sinister 7 Ultra may be greatest challenge of your life. 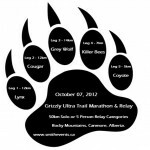 The 100 mile (161km) course will take you through the most rugged, remote and beautiful terrain in Alberta’s stunning Rocky Mountains. With over 6,300m of elevation gain across the course, this race will punish those who are not prepared.